Congratulations to GMA Network, Inc.! The National Association for Multi-Ethnicity in Communications (NAMIC) honored the winners of its Excellence in Multi-Cultural Marketing Awards (EMMA) during the 24th Annual NAMIC Conference, which took place on September 14-15, 2010 at the Hilton New York in Manhattan as part of Diversity Week. The awards competition showcased marketing efforts targeting one or more cultural segments including, but not limited to African American, Asian and Hispanic markets. 1. 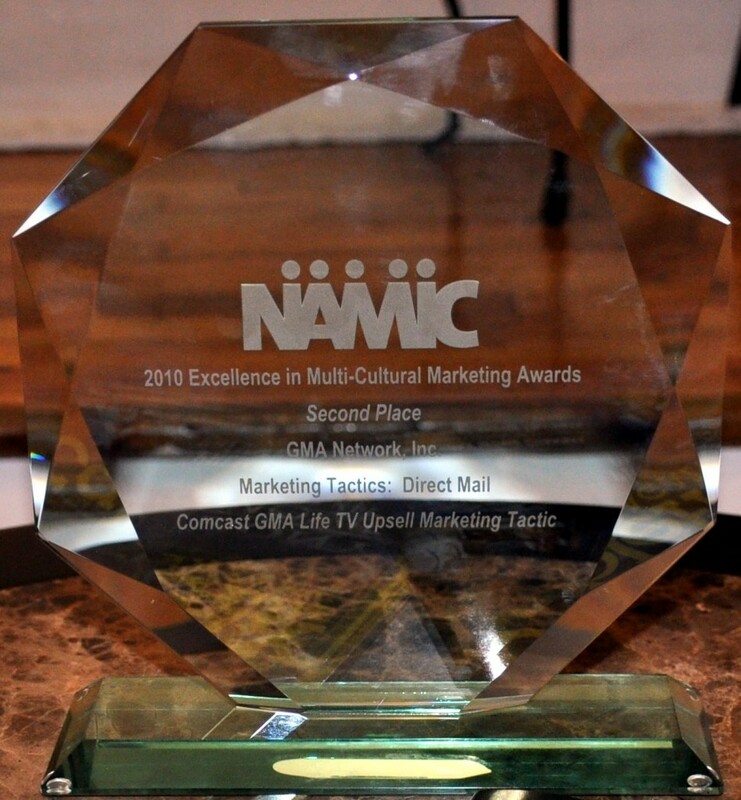 Direct Mail, Second Place – for its COMCAST GMA LIFE TV Upsell Marketing Tactic, GMA Network, Inc.
2. Print, Second Place – COMCAST GMA LIFE TV Upsell Marketing Tactic, GMA Network, Inc. The awards were received by Grace Labaguis, GMA Network, Inc./GMA International Marketing Consultant, East Coast USA. GMA Network, Inc.’s presence in North America is through GMA International, in cable and satellite, as GMA Pinoy TV and GMA Life TV. The EMMA competition recognizes the cable industry’s commitment to maintaining best practices, while developing creative, strategic and innovative approaches to ethnic-targeted marketing. The competition is comprised of two award categories: Marketing Tactics and Case Studies/Campaign. Entries submitted within each category were judged within two divisions: Cable Companies/Distributors and Networks/Industry Suppliers. A judging panel of independent industry experts evaluated entries and selected all winners based on sound and innovative strategy, strength of execution against the strategy, evaluations of strategy, implementation and results. Deviating from the traditional “best of” competition method, each entry was judged against a standard of excellence and not against other entrants, resulting in the potential for zero to multiple winners in each category. Click on SUBSCRIBE NOW if you are interested in subscribing to GMA Pinoy TV and GMA Life TV. 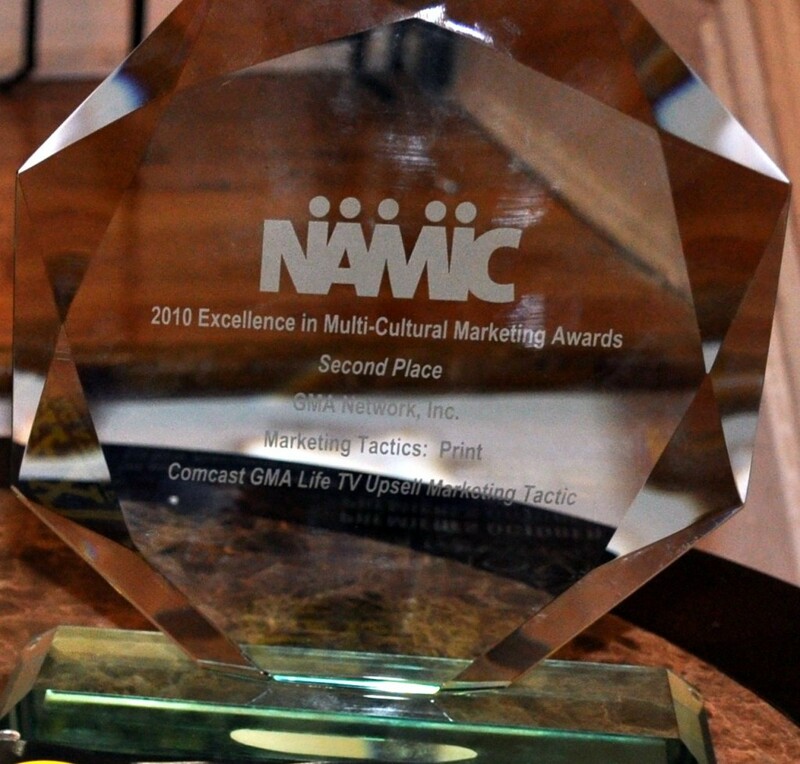 GMA Network wins 2 EMMA Awards at NAMIC, Hilton NYC Sept 14, 2010 from Luis Pedron on Vimeo. Grace Labaguis received the 2 EMMA Awards for GMA Network at NAMIC, at Hilton NYC, Sept 14, 2010 from Luis Pedron on Vimeo. Grace Labaguis of GMA posing with Time Warner Cable awardees at the EMMA at NAMIC, Hilton, NYC Sept 14, 2010 from Luis Pedron on Vimeo. EMMA 1st Place Winners at the NAMIC, Hilton Hotel NYC Sept 14, 2010 from Luis Pedron on Vimeo. INFORMATION ABOUT GMA NETWORK, INC.